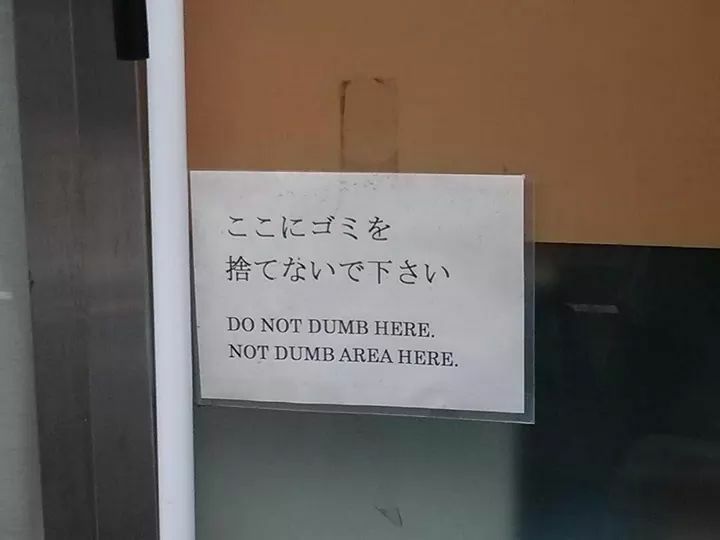 In other words, don't DUMP your garbage here; that would be very DUMB. This being Japan, and inside a tidy building, I don't think they had in mind that other meaning of DUMP. See "Greater and lesser conveniences" (6/25/14) and many similar Language Log posts. The first reply on that link is labouring under several misconceptions. Katakana is not limited to foreign words. It is also used for onomatopoeic words, for emphasis (like ALL CAPS in English), and frequently for words of contempt (e.g. バカ, クソ, ガキ, etc.). There are several other native words that belong to none of these categories which are nevertheless customarily written in Katakana, notably カタカナ itself. Also, ごみ did in fact have not one, but two (塵, 芥) Kanji, though neither of these are still in use. I had the same question as I was preparing this post, so I'm glad you checked on it. I'd guess this use of throw is partly a hispanicism, but I've heard "throw it" for "throw it out" from people in other parts of the country with no apparent Hispanic influence. For me in the Northeast, they're somewhat distinct. I would use "throw it out" to mean placing something in a can or bin, but "throw [trash]" to mean tossing your trash on the ground. A roadsign saying "Do Not Throw Trash" wouldn't strike me as odd, because it's concerned with the second kind of action. I wish we could dumb [sic] this bizarre urban myth that the Japanese use katakana to subtly denigrate the rest of the world. "See, we'll write 'trash' with the same syllabary we use to write loanwords! That means that we think the people who speak the languages we borrow words from are trash!" It isn't worthy of a Michael Crichton novel, let alone the Language Log comments section. Yeah, I'm sorry, I didn't mean to pick on you personally. I was really responding to your link rather than your post (which I interpreted as a joke, actually), especially "I thought that this sentence was really cool because it implied that Japan wants to think of GOMI as something NOT of Japanese origin". This is just ridiculous. So by default there is a tendency to reject ここにごみを捨てないで下さい when writing this sentence. There's strong pressure to mark that ごみを is a constituent somehow. But the problem is, there is no kanji for "gomi". Yes, in the past 塵 and 芥 were both used, but neither of those is on the Joyo Kanji list (and no other kanji is assigned the reading "gomi"), and even when they are used they have the standard readings "chiri" (dust) and "akuta" (seen almost exclusively in proper nouns, usually "Akutagawa"). So writing ここに塵を捨てないで下さい would be interpreted as "(please don't dump) dust here". That leaves only katakana. Thus ここにゴミを捨てないで下さい is the most natural way to write this for people who have internalized a certain combination of very unremarkable orthographic rules. That's not to say that there aren't other rules floating out there. There are style guides dictating hiragana in cases like this, and some people prefer to write things that way for whatever reason (dislike unnecessary katakana, had a very influential teacher who taught them not to, etc.). But it's possible to get the katakana outcome without even bringing semantics into it. That said — there certainly is a tendency to write some other classes of words, like mimetic words and "words of contempt" as Elonkareon says ("gomi" could be considered one). But I don't think you can separate the orthographic issues from the semantic ones entirely. For example: "kuso", "gaki", "baka" (plus "aho" etc.) are all different from "gomi" in that they do have common-standard kanji transcriptions, even if they aren't in the Joyo list. So are they often written in katakana because they are words of contempt, or just because they employ rare/complex kanji and are a hassle to write (like "bara" 薔薇 rose and "utsu" 鬱 depression)? My hypothesis would be that both factors are relevant, and probably reinforcing in a way that makes them inseparable. Note that "zama" as in "zama(a) miro" is much less likely to be written in katakana than other "contempt words"; could this be because it is more often utterance-initial, requiring no boundary marker? Incidentally, many prescriptivists would point out another problem with this sign: "kudasai" meaning "please", they would say, should be written in hiragana, to distinguish it from "kudasai" meaning "(please) give me", which can be written with the kanji. This rule is ignored much more often than similar rules like, say, the one requiring hiragana for the auxiliary "miru" that means "try and do" (as opposed to the actual verb "to see"). Could this be because, for the average Japanese speaker, a stronger boundary is perceived between "sutenaide" + "kudasai" than between, say, "sutete" + "miru"? My hypothesis is yes, but again, I don't know of any research investigating this. Very cool. Someone not me needs to run some statistics, then, on ゴミvs. ごみ (and parallel cases) in isolation / when immediately preceded by hiragana / etc. to try to get at what role orthographical context might be playing here. Are fish names another specific category of things that typically get katakana, or is this a frequent-use-noun-with-no-common-kanji thing? Fish names (and those of all species) are written in katakana when they are used as parts of scientific names, like Linnaeus used Latin to designate scientific classificatory names. Stay tuned on GOMI. I'm collecting as much data as I can: historical, phonological, orthographical, statistical, etc. Will post this evening. One webpage suggests the word "gomi" can be traced back at least to the 13th century epic, "The Tale of the Heike" in which there is a line where "gomi" is mentioned, apparently meaning something like "muddy debris". One Japanese person asks on Yahoo!, "Is 'gomi' supposed to be written in hiragana or katakana? My teacher says it should be written in hiragana in more formal contexts like resumes and essays." I think the question shows that it's often or usually written in katakana, but I think the teacher's reply is correct to suggest that hiragana is to be preferred in more formal usage. One of the replies says "They're both more or less the same, I think. But to clearly segment the word [in the absence of space characters] or to emphasize it, you use katakana." And I think that's true, too. In the following comments, I will post responses from colleagues who are specialists on Japanese language. They are all native speakers or have native fluency. Since those who are following this extended discussion carefully will know Japanese, I will not romanize the kanji and kana as I usually do. To answer your last question first, 芥、塵、and 埖 are all readable as “gomi” but all are rarely used. As a pun, I have also seen 五味市 and 御美市 (both pronounced “gomiichi”) used to advertised flea markets (a.k.a. フリーマーケット, punning with “free market"), arguably places where one man’s trash is another man’s treasure. Nagomiichi 和市 is also used for flea markets. ゴミ seems more palatable than ごみ, perhaps because of the distancing effect of katakana, making it feel like a mere sound rather than a real word. Good luck with finding statistics. You’re absolutely right, Victor; gomi seems to be a native word. It’s sometimes written with the kanji 塵 or 芥, but those are just kunyomi usages, the writing of native words with Chinese characters. And yeah, as you say, gomi is sometimes written with katakana as well. What’s going on? I confess I don’t know—I probably should have, but I hadn’t even thought about the etymology until I saw your message. The word is attested at least as far back as Kamakura/Muromachi times, and the Portuguese noticed gomi and wrote it down, too. Even the phonological shape is odd; native words usually don’t begin with a voiced obstruent, but this one does. /b d g z/ never appear word-initially in Old Japanese, only word-medially. As Guenther Wenck pointed out in the 1960s, many pejoratives are made up from ordinary words with initial /p t k s/ in OJ terms. (/p/ developed into /h/ word-initially.) Komi is the deverbal (infinitive) of kom- 'put in, stick in'. Assuming that 'stuff [to throw away]' was one possible connotation of komi (cf. the English semantic development of stuff), its overtly marked pejorative form would have been gomi. P.S. I forgot to say that pejoratives are indicated by changing initial /p t k s/ to /b d g z/ (perhaps this omission was obvious). Other (possible) examples: tor- 'take' ~ doro-boo 'thief', suru-do- 'sharp' ~ zuru- 'cheating, mean', hakar- 'plan, think' ~ baka 'fool', huto- 'thick, fat' ?~ buta 'pig', and so on. Both appear in my online dictionary as nouns read gomi, meaning “trash, rubbish, garbage, refuse,” but the usage note says they are usually written in kana. I certainly wouldn’t have recognized either character. To paraphrase Twain's apocryphal quote: please forgive the long response, I did not have time to write a short one. There are probably at least two (related) reasons that ゴミ is often written in katakana. 1. As you say, there are no kanji in common usage (see below). This makes it hard to find the word in a string of hiragana, so it probably started as a matter of orthographic clarity. This is substantiated below. 2. Katakana provides simple emphasis (it's basically italics), and also a (perhaps very slight, and certainly decreasing now) psychological distance from the named item. 2. The law uses hiragana. Though the reason is not made clear, it is probably one of simple orthodoxy. 芥 is most often listed as the kanji for ごみ, but 塵 and 埖 can also be used. None are. プ ログレッシブ和英中辞典 (Shogakukan) gives the following set of definitions. More interesting, notice the orthography — even in its own dictionary entry, the kanji is never used! The resort area was covered with heaps of rubbish [trash]. "Something discarded b/c of being rotten, etc. Trash. Waste. Refuse. Additionally, metaphorically, something worthless." "As opposed to chiri (note: kanji is 塵), which denotes something dry and powdery (note: i.e. dust), akuta means moist/wet waste. This is the same dichotomy seen in hokori vs. gomi." However, akuta and gomi can be used for all waste as well. "In contemporary standard Japanese, akuta is obsolete, but lives on in certain dialects…"
I have seen 護美箱is used for Gomibako (trash bin), but it is probably a combination of Kanji selected from the meaning (a box protecting beauty/cleanliness). I have never seen 護美 alone without 箱.
I am not sure why "gomi" is often in katakana, but some opinions on the Internet say that some words are written in katakana so that the readers can recognize them easily. For example, between "これはごみです" and "これはゴミです," the latter with "gomi" in katakana makes it easier to recognize "gomi" as a noun. However, this is just information randomly found on the Internet (but it makes sense to me). I thought about some other examples of this kind. They are not necessarily for easy recognition, I feel. The second one from the top, "bimyou," causes me very casual, colloquial impression, while the bottom one, "merihari," is used by all generations in all kinds of contexts. I rarely see "merihari" written with kanji. It seems kanji for "gomi" is the kun-yomi of 塵. It is also put together with the character "chiri" (ちり, 塵），and read じんかい（塵芥）or "chiri-akuta." That's the complication of the Japanese language. According to what I gather, gomi is not foreign word (so not katakana word) or onomatopic word. So in the formal context such as municipally-owned offices and docments, they often use Hiragana. You can see the keizai sangyo sho link here as an example, and they use gomi in Hiragana. Gomi, however, are often written in Katakana; it seems to be used to give some emphasis, to make it stand out in sentences in order to get attention from the reader. Unfortunately, I couldn't find any statistics of the katakana writing of "gomi" versus the hiragana writing of it. Lastly, they say that there are kanji for gomi 塵／芥. But these kanjis are not usually used (I had never known that we had some kanji for Gomi).